Hormones are secreted molecules that carry biological information between cells. This type of cell-to-cell communication is vital to human life, and its dysregulation often underlies disease. In fact, the largest known class of cell surface receptors involved in hormone communication, G-protein coupled receptors, are also the largest class of known drug targets. Understanding these communication processes and their dysregulation requires an ability to ‘listen in’ on hormone communications with high fidelity. To do this, highly sensitive and specific measurements of often challenging-to-detect chemical species – for example, peptides and proteins – must be made from within complex matrices such as biological fluids and tissues. This challenge has given rise to sophisticated analytical techniques for in vivo hormone measurements, including implanted microelectrodes for in situ detection of electrochemically active hormones from model organisms, and microdialysis for in situ sampling of electrically inactive molecules for ex vivo measurements. Taking measurements from the tissues of living model organisms imparts broad biological and behavioural context to the measurements, but the inherent complexity and diversity of biological systems can obscure the underlying regulatory mechanisms of cellular communications. An alternative approach is the in vitro measurement of cellular secretions in a chemically and physically well-controlled environment. The emerging field of organ-on-a-chip research aims to develop organ-mimetic cell culture systems within microfluidic devices, where exquisite control of the solution environment and the delivery of nutrients and chemical stimuli is possible via precise laminar perfusion systems. In addition to improved organ-mimetic cell culture conditions, microfluidic systems can offer analytical advantages over measurement platforms of larger volumes. Analysing cellular secretions within small volumes improves the mass limits of detection that can be achieved by conventional assays. For example, fluorescence assays may offer ca. 1nM concentration limits of detection, which corresponds to measuring 6 × 1010 molecules in a 100μL well of a microtiter plate, but only 6 × 105 molecules within a 1nL microfluidic volume. Improved mass limits of detection and reduced dilution of cellular secretions in microfluidic systems can be leveraged to improve the temporal resolution of secretion measurements, thereby capturing time course profiles of secretion dynamics. Rapid measurements in microfluidic devices are complemented by physical phenomena at the micro-scale, such as enhanced mass transfer effects and the availability of electroosmotic fluid manipulations, which offer additional analytical advantages and the potential for automation of complex analyses. To realise the advantages of microfluidic systems in the study of cell-to-cell chemical communications, advanced analytical platforms are continually being developed to address specific biological and analytical challenges. These microfluidic systems often integrate novel detection strategies to maximise the information content of a single microfluidic analysis. While a more comprehensive discussion of the developments in this field was recently offered by Roper2, this article outlines several recent reports that illustrate the analytical advantages of cellular secretion measurements in microfluidic systems and the breadth of the challenges that these systems address. Intracellular Ca2+ concentration ([Ca2+]i) is an indicator of hormone exocytosis, and is commonly measured spectroscopically within microfluidic tissue culture platforms. Intracellular calcium monitoring is a particularly useful tool for characterising cellular secretion dynamics, because spectroscopic measurements can be made with high temporal resolution. Interestingly, [Ca2+]i monitoring has elucidated mechanisms of blood glucose regulation by pancreatic islets of Langerhans. Via on-chip perfusion, a population of islets was stimulated with glucose concentration waveforms, resulting in pulsatile [Ca2+]i indicating pulsatile insulin secretion. Negative feedback mechanisms were shown to cause the entrainment of insulin secretion to the stimulating glucose waveforms3. The precision control of perfusion conditions achievable within microfluidic devices enabled the investigation of islet entrainment to complex glucose waveforms with chirped frequencies4. Measurements of secreted peptide hormones enable more specific hormone analyses than those of [Ca2+]i measurements. Islet entrainment parameters were recently characterised by directly measuring insulin secretion using an online electrophoresis immunoassay5. 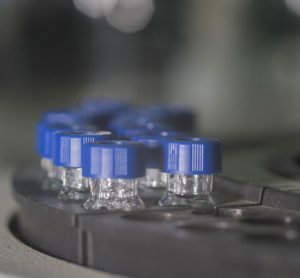 Direct peptide measurements also enable the study of co-secreted peptides, even when there is a significant disparity of peptide hormone concentrations. Lomasney and coworkers addressed the challenge of measuring the co-secretion of insulin and islet amyloid polypeptide from pancreatic islets using an electrophoresis immunoassay with dual wavelength fluorescence detection6. While much work has focused on the characterisation of endocrine function in model animal tissue, human pancreatic islets of Langerhans are also the focus of significant preclinical study, informing understanding of endocrine tissue for transplant applications. Heileman and coworkers integrated microfluidics with dielectric spectroscopy as a non-invasive technique to measure insulin secretion in response to glucose and the phosphodiesterase inhibitor 3-isobutyl-1-methylxanthine (IBMX). Introduction of IBMX, a common islet culture additive, produces cyclic adenosine monophosphate (c-AMP) to stimulate insulin secretion. Dielectric spectroscopy resolved mechanistic differences of glucose-induced and IBMX/cAMP-mediated insulin release. As with other spectroscopic methods, integration of microfluidics with dielectric spectroscopy enabled near real-time measurements of islet response, which facilitated continuous dynamic measurements that resolve the oscillatory profile of insulin secretion7. Interestingly, Silva and coworkers leveraged the enhanced delivery of culture media in microfluidic perfusion systems to preserve the morphology of human islets in ex vivo culture. Significant microfluidic device development was devoted to minimising shear stress on endocrine cells, while promoting enhanced media flow through islet vasculature. As a result, endothelial cell morphology was preserved in culture, indicating improved vascular health within cultured human islets8. Recently, microfluidic separations-based measurements have characterised the simultaneous secretion profiles of nine amino acid hormones from human islets9. Pancreatic islets are not the only endocrine tissue to which microfluidics have been applied. Adipocytes play a significant endocrine role, and their secretion profiles are of interest in understanding the pathophysiology of obesity and metabolic syndrome. 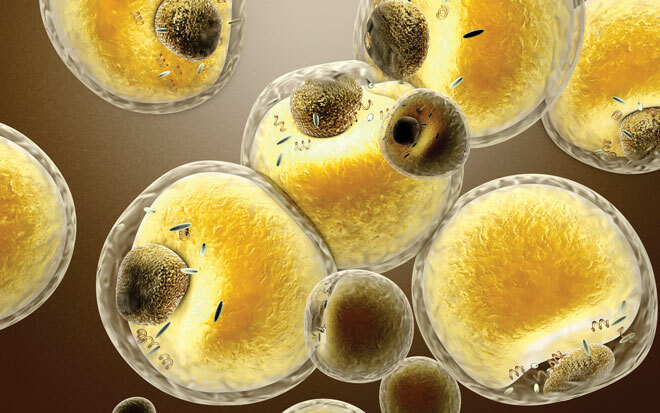 Challenges of cell density and morphology make adipocytes challenging to work with, and studies of cellular secretion from adipocytes have been less common than those of islets. A microfluidic system was reported for the analysis of adiponectin secretion from primary adipocytes stimulated with insulin or niacin. Microfluidics allowed for 50-100 experiments per model animal, since only 0.5 – 1mL total adipose tissue could be collected per animal10. The ability to measure co-secreted hormones is essential to understanding the regulatory dynamics of endocrine tissues. Simultaneous measurements of glycerol and fatty acids from adipocytes have been made in near real-time by employing a microfluidic perfusion system and a two-enzyme assay. Analyses were carried out in a PDMS microfluidic device modified with sodium dodecyl sulfate (SDS) to prevent loss of analyte molecules by adsorption. This device facilitated rapid and sensitive adipocyte secretion measurements and was used to measure secretions for basal conditions and isoproterenol-stimulated lipolysis11. By integrating on-line cell culture or co-culture with fluidic mechanisms for controlling cell-to-cell signalling, microfluidic devices represent excellent platforms for developing in vitro models of cellular communications. Liu and coworkers used a three-dimensionally printed fluidic device to study communication between INS-1 beta cells, erythrocytes and endothelia. Albumin and the beta cell-secreted hormone c-peptide were shown to be cofactors in zinc uptake by erythrocytes. Interestingly, glucose stimulation of INS-1 cells, which stimulates c-peptide and zinc secretion, was shown to increase adenosine triphosphate (ATP) release from erythrocytes perfused through the culture device. Increased ATP resulted in an increase in nitric oxide production from endothelia cultured within the device12. This work represents an intricate model of complex endocrine signaling in vitro, and illustrates the potential of microfluidic technologies for developing such models. Microfluidic co-culture has also demonstrated potential for modelling diseased state cellular communications. Zhou and coworkers developed a microfluidic co-culture system to measure transforming growth factor (TGF) communications between hepatocytes and stellate cells. Applied as a model of alcohol-induced liver damage, increased TGF secretion was observed in the presence of ethanol13. Microfluidic systems can also be used to enable high spatial resolution in cellular signalling measurements. Byrne and coworkers described a microfluidic three dimensional co-culture platform to study the spatiotemporal dynamics of cellular communication between mouse macrophage cells and HEK 293 cells14. Chen and coworkers applied [Ca2+]i imaging to spatially characterise intercellular communications using localised ATP stimulation of NIH3T3 embryonic cells. Precise laminar flow allowed the stimulation of a small subpopulation of cells with ATP, while [Ca2+]i imaging of adjacent cells not subjected to ATP stimulation revealed temporal dynamics of intercellular communications on the time scale of ca. 10 s15. This work utilised a common microfluidic flow architecture to achieve spatially resolved cell stimulus in a manner that would be exceedingly challenging to achieve in larger scale cell culture systems. Small length and volume scales make microfluidic systems uniquely suited to studying processes at the single cell level. Single cell studies hold particular promise for understanding the pathophysiology of cancers, because they typically involve low numbers of diseased cell types. Microfluidic cell trapping techniques are therefore needed to probe cellular responses from small quantities of cells. The dynamic secretion of matrix metalloproteinase 9 (MMP-9) from lymphoma cells was monitored using a microfluidic fluorescence resonance energy transfer (FRET) experiment. Fluorescence detection occurred when FRET-labelled peptides were cleaved by protease MMP-9 secreted from single cells captured on a photodegradable antibody-functionalised hydrogel using reconfigurable compartments.16 To illustrate the potential with microfluidic devices with reconfigurable compartments applied to dynamic measurements of single-cell secretions, a device that combines reconfigurable confinement stalls with antibody-functionalised microbeads was used to detect IFN-γ released from T-cells and exosome sections from cancer cells17. As with spectroscopic detection of [Ca2+]i, optical techniques such as localised surface plasmon resonance or nanoslit surface plasmon resonance (SPR) have been integrated with microfluidic platforms to yield high temporal resolution measurements. Raphael and coworkers detected antibody secretions from single hybridoma cells on the time scale of minutes18. Nanoslit SPR was shown to deliver measurements of real-time secretion dynamics of MMP-9 release from THP1 cells. Antibodies were immobilised on gold nanoslits and SPR response was measured upon immunocomplexation due to the change of refractive index for the surface19. Nucleic acid aptamers present a synthetic alternative to antibodies for analyte recognition and capture. Aptamers simplify fluorescent labeling, and can enable high sensitivity detection via enzymatic amplification. They have been applied to measure the dynamics of IFN-γ released from T-cells. To enable continuous dynamic monitoring of secretions from trapped single cells, a method to replenish the sensor by rapidly removing detected analyte from immobilised aptamers was needed. Microcup structures were developed to protect cells during this replenishment process20. Using this device configuration for experimental verification, a mathematical model for deriving cell secretion rate was developed21. In a separate study, multi-analyte measurements of cytokine secretions were described using apta-sensors with redox reporters for detection22. The reports described here deal with the challenges of hormone communication measurements from primary tissue and model cell lines. They discuss applications to human disease ranging from metabolic syndrome to cancer. To the challenge of increasing the analytical performance and biological relevance of these measurements, these reports present diverse answers ranging from newly applied spectroscopic approaches to innovative cell culture platforms. In each case, these works describe cell signalling studies that could not be achieved at the macro-scale, and highlight the need for microfluidic technologies in the study of cellular signalling. Laura Casto completed her BS in Chemistry and Mathematics at West Virginia Wesleyan College and is currently in her third year of graduate study at The University of Tennessee, Knoxville, in pursuit of her PhD in Analytical Chemistry. Her research involves the development of immunoaffinity assays for measuring neuropeptide hormone dynamics. Christopher A. Baker earned his BS in Chemistry from Wayne State University in 2007, and his PhD in Bioanalytical Chemistry from Florida State University in 2012. He was a postdoctoral associate at The University of Arizona (2012-2014), and Sandia National Laboratories (2014-2015). Currently, he leads a research programme in The Department of Chemistry at The University of Tennessee, Knoxville. The Baker Bioanalysis Lab is developing new micro- and nanotechnologies to measure important biological signals involved in neurodevelopmental and neurodegenerative disorders.